Vegetable burgers are an all time hit menu at home. It can be prepared healthy at home and tastes great by using our own wholesome ingredients. 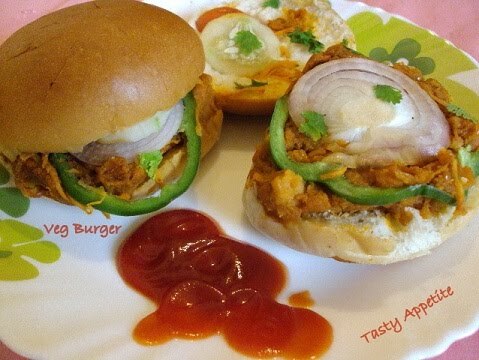 In this recipe the burger buns are shallow fried in butter and stuffed with potato masala, onion, cucumber, tomato, salad and capsicum.Here is the wholesome filling snack & everybody’s favorite Veggie burger recipe. Heat oil in a pan, add chopped onions and chilli ginger paste to it. Sauté for 3 to 5 mins. Add salt, pepper pwd, red chilly pwd , vegetables and mix well. Add little water and allow to cook. Once it is done, smash the contents. Add cheese , wheat flour, garam masala, lemon juice and combine. Allow to cook in low flame, until the mixture turns thick. Turn off the flame, and allow to cool. Now, cut each bun horizontally into two and toast them lightly in an oven or on a griddle. Spread a little tomato ketchup on the lower half. Place the veggie mixture on top. Then place a capsicum slice, onion slice, cucumber slice, tomato slice, cheese slice and chopped coriander leaves. Spread some fresh cream on top and then cover with the remaining half of the bun. Repeat with the remaining ingredients to make more burgers. Veggie burger is ready to eat. Serve hot with Tomato Ketchup. yummm.. homemade always the best.. Happy 4 th of July 2015..!! !